Keeping track of that cord can be tough- as workspaces, homes, and markets grow increasingly reliant on audio and video technology to provide comprehensive user experiences, sending the right signals often becomes a chore. Nothing is more confounding than sifting through a tangle of wires. Luckily, there is an economical and reliable solution: multi-display matrix routing switches. What is a Matrix Switch? Video matrix switches are hardware products specifically designed to route multiple input A/V signals to various displays with organized ease. Built with a varying amount of ports, the matrix will connect devices seamlessly between any input and output on the box. Furthermore, matrices can connect with one another to create even more expansive and powerful matrix systems, providing order to even the most complex multi-display set-ups. As more environments incorporate digital A/V devices into their routines, keeping signals structured and manageable with matrix systems is critical for success. Thanks to matrix systems, multimedia and information get where they need to go with efficient and effective results. Do You Need a Matrix Switch? 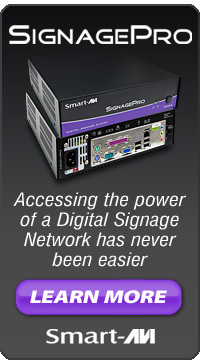 As the need for multi-display routing increases, the applications for matrix switching grow every day. Control rooms, airports, security centers, shopping complexes, hotels, presentation spaces, and more utilize matrix switches to better control and operate multiple devices remotely and effortlessly. Seamlessly linking digital media devices has a practical appeal in casual spaces, as well. Home entertainment systems and personal offices incorporate multiple signal sources from a wide array of connecting devices. A matrix can simplify signal traffic and digital interactions in a way anyone will understand. Matrix switches are useful in any situation, from strictly business to straight-up fun. Just plug it in and get going! Utilizing multiple input and output ports, a matrix switch connects devices to any display with control and convenience. Hardwired sources can display on any of the matrix’s outputs, and are interchangeable based on the individual preference of the user. There are a variety of control methods for matrices, including front panel buttons, remote controls, and even TCP/IP support via web browsers. Set-ups are completely customizable, meaning you can control the flow of information the way you want, when you want. Matrix switches can interconnect and link together without hassle, meaning your setup is secure and organized regardless of how complex it may seem. Whether you’re linking two devices or twenty-two, matrix systems are always working to simplify your multi-device needs. 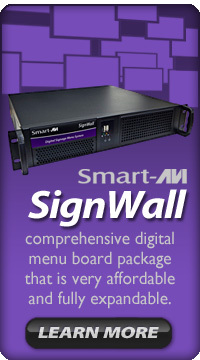 SmartAVI, an American Pro A/V company, offers a wide range of matrix routing solutions designed for users who have no technical training. Products range from basic plug-and-play hardware to highly customizable PC-based, software-run systems. SmartAVI tailors its matrix routing solutions specifically to the needs of each customer. Categories: hdmi matrix, Technology, video, video switch | Tags: hardware, matrix, SmartAVI, switch, video | Permalink. The 4K-Wall provides impressive flexibility and customization for users who need a unique and vibrant video wall/digital signage display. A key aspect of the 4K-Wall is the way users can customize the way they display their video content, from one large image over four screens, to four images sent to each screen, and more. With programmable blending and positioning of all four sources, eye-catching formats can be generated and reconfigured instantly. 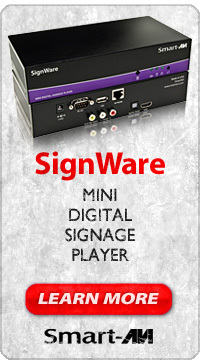 Categories: digital signage, hdmi, Uncategorized, video wall, video wall hardware | Tags: 4K, digital signage hardware, hdmi, hdmi matrix, SmartAVI, video wall, video wall hardware | Permalink.